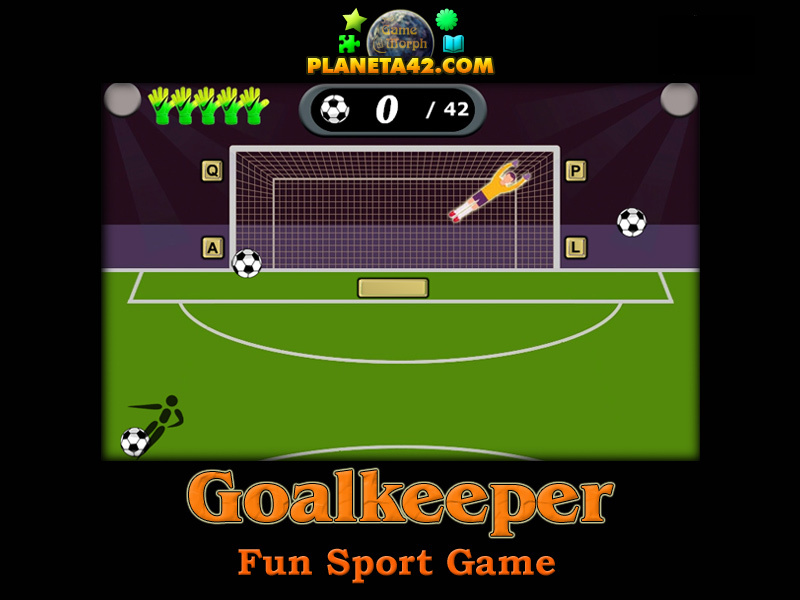 Play as football goalkeeper online. "Goalkeeper" is a free online sport game to save football balls from the door. Use q,a,p and l keyboard keys to move the goalkeeper and do not let too many goals. Sports learning game. Online ball game. Program code by Ogo Bob. Pictures by istockphoto.com and autor:vector. You take parts as a goalkeeper in a foorball game. Use the keyboard keys "Q", "A", "P" and "L" to move the goalkeeper in 4 different positions. The attacking players begins to shoot balls to the four corners of the door. Save the incoming balls before they make a Goal. You hae 6 Gloves, or 6 balls to miss. Make 42 saved balls to win the game. Know what goalkeepers do in a football game and win +1 Knowledge Level. In many team sports which involve scoring goals, the goalkeeper is a designated player charged with directly preventing the opposing team from scoring a goal, by intercepting shots towards the door. Such positions exist in international rules football and other sports. Usually special rules apply to the goalkeeper that do not apply to other players. These rules are often instituted to protect the goalkeeper, being an obvious target for dangerous or even violent actions. In certain sports like ice hockey, goalkeepers are required to wear special equipment like heavy pads and a face mask to protect their bodies from the impact of the playing object. In some sports, goalkeepers may have the same rights as other players; in association football, for example, the keeper is allowed to kick the ball just as any other player, but may also handle it in a restricted area. Labels: Sport Games , Ball Games , Football , Shooting Games , Education Games , Free Online Games.